There's no bigger, bolder or brassier show this Christmas. 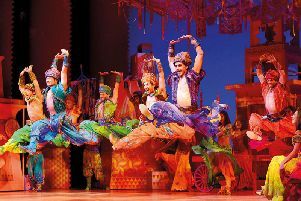 Disney's Aladdin is a super-slick spectacular perfect for families seeking a festive theatrical treat without the usual pantomimic trappings. The production ostensibly takes its cue from the much-loved 1992 animated version, but it may be wise to leave memories of the film at the door and view this as a piece of theatre in its own right. The story is the same, the songs are the same, the general feel is the same; but there are simply things that can be done with cartoons that cannot be replicated on stage. Happily, there are things that can be accomplished in a theatre that no cinema will ever replicate, and this show is replete with those. Aladdin gets into its fast-talking, fast-singing, fast-dancing stride early and rarely relents. It's akin to watching TV on a set with the colour and volume turned up to the threshold of bearability and all the action at roughly double the usual speed. It makes for a production that's certainly breathless, but at times threatens to be rather airless; there is little audience participation, and for much of the first half there is a sense that the show would have been just the same were the performers playing to an empty theatre. This sense of slight disengagement was not helped by the difficulty of hearing the songs' well-crafted words amid the high-energy routines and bright but busy musical arrangements. And for all the undoubted effort and talent on display, the cartoonish staging makes for some rather thin, flat and sparse sets. But when the show works, it really works. The theatre was filled with gasps as Aladdin entered the gilded cave in which the legendary lamp was hidden; the stage drips imposingly and wondrously in dazzling gold. And just as the Genie came to the aid of Aladdin, so he proves invaluable to this show: following an all too brief introduction at its outset, his magical reappearance as he emerged from the lamp led to him being greeted by the audience like a long-lost and much-loved friend. Suddenly there was an electric connection between the audience and the performers: he had the whole house shouting, whooping and hollering with delight. It perhaps showed what had been missing thus far, but no matter; whenever he was on stage, the production truly sang. Trevor Dion Nicholas deserves enormous credit for his performance; his genie was the most recognisably human of all the characters, with just enough regret at his plight to undercut his exuberance. He led the breathtaking, almost overwhelming production number Friend Like Me with tremendous skill and heart. The audience received it with deserved rapture. But the show's emotional peak was still to come. By the second half, the Genie had granted Aladdin's wish to become a prince, so he can win the heart of Princess Jasmine, who had so beguiled him in an encounter at Agrabah's marketplace. Having found his way into the Princess's chamber, the pair embark on a truly wondrous ride on a magic carpet, the set bedecked with stars as they fly gracefully - and with no visible means of support - while singing the duet A Whole New World. It was not just the astounding technical accomplishment that made it stand out, but the fact it was a rare moment of calm and tenderness, all done with an exquisitely tender touch. As might be expected of a Disney production, there is no weak link in terms of performances. Matthew Croke makes for a twinkly, sprightly and likeable Aladdin, while Jade Ewen brings sharpness, wit, decency and dignity to Princess Jasmine. The villainous Jafar and mischievous Iago made a good double act, and the demanding dance routines were all accomplished with aplomb, as styles varied from the athletic to the elegant. There was tremendous work from the orchestra, too, which glided effortlessly from genre to genre. And the story's themes - being true to oneself and the downsides of having our wishes fulfilled - carry subtle depth. 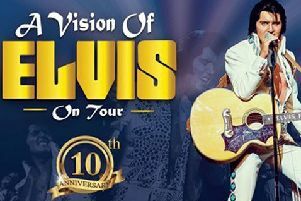 There is obviously no shortage of family entertainment at this time of year, and there will be much to cherish at more local theatres. But for sheer bombast, this will be hard to beat anywhere. And it's easy to get to and from: the theatre is only a ten-minute walk from Picadilly Circus and the show finishes on the dot at 10pm, meaning there's unlikely to be a need to rush for the last train. There's glitz, glamour, spectacle, fun, laughter and a happy ending. It's pretty much all anyone could want from the theatre this Christmas. * Visit aladdinthemusical.co.uk to book.